The future of South Figueroa at 11th Street? Doesn't seem far fetched now. Click on the image for a high-res copy. The MyFigueroa team will be presenting all their images and renderings at the Andrew Norman Hall Orthopaedic Hospital at 5:30 pm on April 9th. Get the event details at the MyFigueroa website. Of course, we’ll be Live Streaming at Streetsblog TV. Bookmark our event page now. It seems like just yesterday a team of Los Angeles’ most progressive planners and international planning rock stars from Gehl Architects unveiled some planning images showing how the rather bleak South Figueroa Corridor could be transformed into a complete street. While the public was “mostly positive,” it seemed a stretch that such a project would ever take place in Los Angeles. In truth, it wasn’t yesterday. It was over two years ago. But despite some major hurdles, such as the minor issue of the dissolution of the Community Redevelopment Agency responsible for the project, the $20 million project should be completed on-time before the end of 2014. 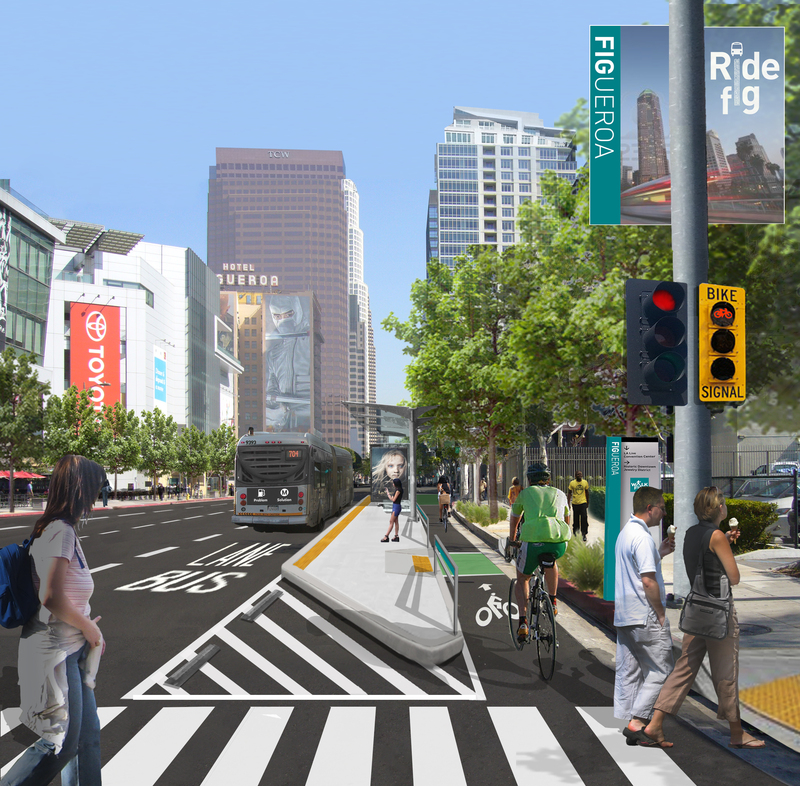 The newly released images don’t look quite as dramatic as the ones shown a in 2011, but still promise bus only lanes, new transit waiting areas, fixed sidewalks, zebra crosswalks and the minor issue of separated bike lanes, proudly marked as “cycletracks” in MyFigueroa’s promotional materials. The project isn’t just about improving Figueroa Street between 7th Street (in Downtown Los Angeles) and Martin Luther King Jr. Boulevard (in South Los Angeles) by offering a full buffet of safe and comfortable transportation options. It also includes new streetscapes on 11th Street between Figueroa Street and Broadway and Martin Luther King Jr. Boulevard from Figueroa Street and Vermont Avenue. Funding for the project comes from Proposition 1C funds, dedicated towards improving transportation and quality of life for residents of affordable housing. Despite the advanced design and secured funding, the project isn’t finalized yet. LADOT, the lead agency with the city, is completing and environmental study on the traffic impacts of the study. Under new legislation passed into law last year, the city does not need to complete a full CEQA review. 11th and Hope. Click on the image for a high-res version. Along Figueroa Corridor, there are two different sections with different layouts. Between 7th and Exposition, the road is 82 feet wide for nearly three miles. South of Exposition, Figueroa shrinks to 67 feet for another mile. In this second stretch, the separated bike lane is replaced by a traditional bike lane as the parking buffer dissapears. 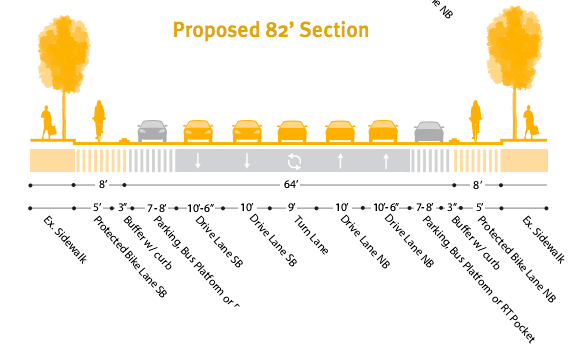 The bike lane itself shrinks from eight feet to five feet in the same space. 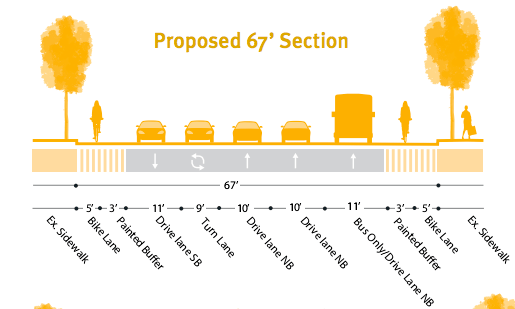 The number of traffic lanes also shrinks in the 67 foot section. North of Exposition the road design calls for five mixed use travel lanes. South of Exposition it’s down to four mixed use lanes and a bus only lane. The bus only lane provides a buffer of sorts for bike traffic heading south. Along 11th street from Figueroa to Broadway, the existing two lanes of westbound one-way traffic will be shrunk to one lane. 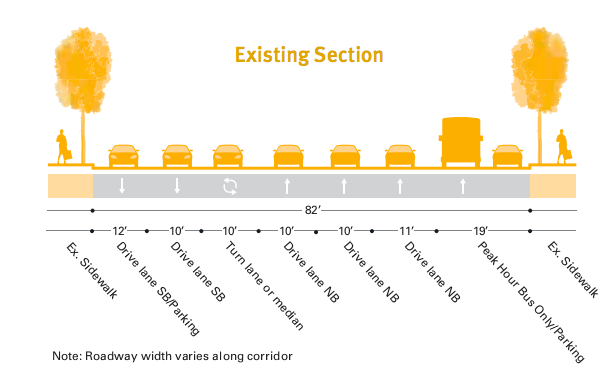 The single remaining lane is designed for both the existing car traffic and the future L.A. Downtown Streetcar A one-way westbound bicycle facility will be provided on the street as well, and will be separated from moving traffic by a painted buffer. On the north side of the street, existing sidewalks will be expanded as possible, providing a much more generous pedestrian realm with planting and seating. The improvements along Martin Luther King Jr. Boulevard will be somewhat less dramatic, but will provided needed relief for pedestrians and transit riders in the under-supported area. Improvements will be made to the pedestrian zone on the north side of the street by repairing the paving, increasing pedestrian scale lighting and adding street trees. On the south side of the street, the physical configuration of the sidewalk cannot be changed, but paving will be repaired and lighting improved as needed and possible. Transit waiting areas on both the north and south side of the street will be improved as needed, and to the extent that space constraints allow, and connections across the street facilitated by highly visible crosswalk striping. In the weeks leading up to April 9th event, more and more details of the program will come out. As we mentioned above, we’ll be broadcasting the meeting on Streetsblog TV. We’re told the wi-fi isn’t the best at Andrew Norman Hall Orthopaedic Hospital, so we’ll repost all the raw footage on April 10. Full disclosure: Deborah Murphy is a member of the Southern California Streets Initiative Board of Directors which oversees the funding and editorial content of Streetsblog Los Angeles. It would be nice if that rendering of 11th St had the streetcar tracks too! This “new” transit project looks great! Hopefully the timeline won’t be too inaccurate. Car traffic will still be terrible if it comes to fruition, but perhaps more people will sell their cars and use mass transit instead. Faster mass transit + increased vehicle traffic = higher ridership. Can’t wait for this long-awaited project to become a reality. It should really help provide better pedetrian, bike and transit connections to the USC campus from downtown and vice versa. 8 foot, single direction, cycle tracks! Somebody gets it! This is what every arterial should have if you want to actually get people on bikes, instead of just talking about getting people on bikes. But wait, what is that picture at the top? It’s at 11th Street, so it’s in the 82 foot section, but that is definitely not an 8 foot wide cycle track. Does this mean the 8 foot wide cycle track gets bottle necked at every bus stop. Where else does this happen? Maybe somebody doesn’t get it. If the safety for bicycling is reduced along portions of this project, then it will effectively make the whole route less attractive to ride on. When you raise the stress level for bicycling on any link in a route beyond what people will tolerate, then that makes the whole route too stressful to ride a bicycle on for them. Way to persevere Deborah!! Now to implement. I agree with Dennis. Unfortunately, bicyclists are often viewed by many Angelenos as a nuisance as opposed to a benefit. Cycling eases congestion and has the potential to improve overall air quality. They need to re-brand and make it “Fig 4 All” or #fig4all or Figueroa For All and so widen the scope beyond “MyFigueroa” and the insular mentality most Angelenos develop after so many long years stuck in the metal-hulled ships within which we sail from mall to mall. Steal the name a group of plucky neighbors developed for N. Figueroa and watch how the psychological map will be drawn across the 110 freeway – to allow us all to dream of a day when that blasted thing is re-purposed into a more normal street again. Or not. In either case, i like Figueroa 4 All better. It translates just as nicely into Spanish as Figueroa Por Todos. street’s potholes, traffic problems, and sidewalk repairs. parties involved. We at USC are happy about the proposal and want them sooner rather than later. Thank you for your long and detailed project. Several of us at Streetsblog believe this project to be a crucial one and want to see it carried forward. I know USC has been involved with the project, but I do not know to what extent they have endorsed, or not, the project as a whole.